Alaska is one of the most breathtaking natural wonders I’ve experienced. 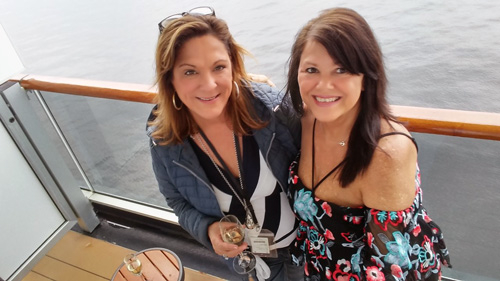 Sailing roundtrip from Seattle on the 7 Day Alaskan Explorer cruise with Holland America Line on the beautiful Eurodam was the best choice for my first Alaska cruise. As I pour over the dozens of photos I am so moved by the majesty of our 49th state. 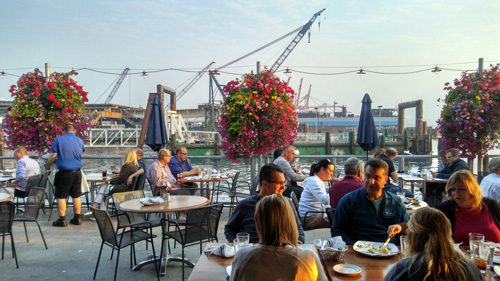 We flew to Seattle one day early to ensure we arrived on time and enjoy the city. 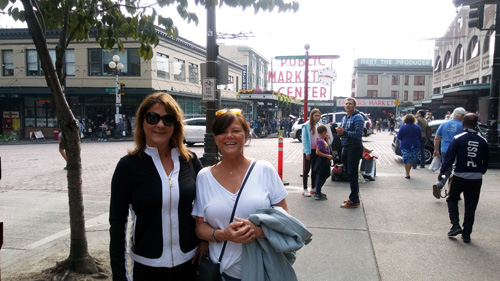 We got to check out the famous Pikes Place Market and later enjoyed dinner on the pier at one of Seattle’s oldest restaurants, Ivar’s Acres of Clams. Boarding the Eurodam was impressive, honestly I think it was the smoothest and quickest embarkation I have experienced out of the last 10 cruises I have been on. Our luggage arrived promptly after we boarded, our balcony cabin was roomy and offered stunning views. I highly recommend booking a balcony if it’s in the budget, especially when there is such unique scenery and temperature variance. So convenient to step out and take photos, experience the cold weather for a bit and step right back in to our warm and cozy stateroom. The views constantly change so it’s like having a different beautiful wall mural every few hours. Champagne Cheers and we’re off to Alaska! Onboard the ship there are a variety of activities to participate in. 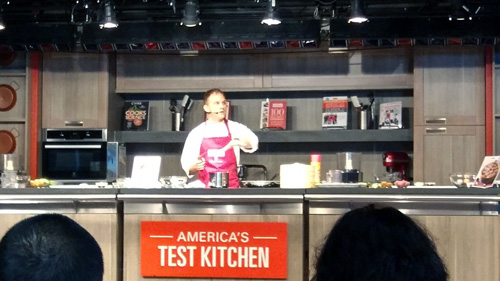 Holland America has exclusively collaborated with America’s Test Kitchen to provide live onboard cooking demonstrations and workshops and we decided to pop in for a few lessons. 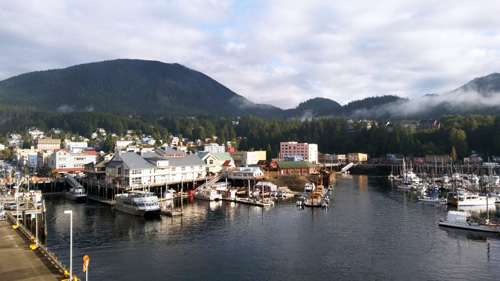 The first port we visited was Juneau. I was told about and prepared for the likely change in the weather and therefore for the excursion plans so we booked two, one early upon arrival and a different one in the evening. I have to admit even though I was aware the weather in Juneau is often quite rainy and volatile, at first I was still a bit disappointed we had to miss the helicopter tour to the top of a glacier and dog sled camp due to rain and fog. 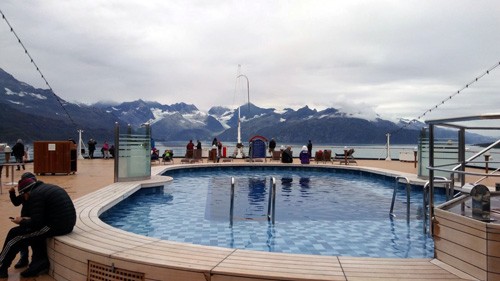 I was really looking forward to that one, but now it gives me a reason to go on another Alaskan cruise! We were able to walk around town as the rain was intermittent and light and it was nice to see the actual town, browse the many shops and buy some souvenirs. Our evening whale watching tour was a go even though it was still quite gray and foggy. 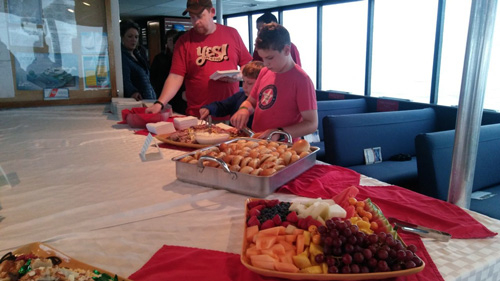 The tour came with lovely appetizer spread, hot and cold beverages and lots of opportunities of guaranteed whale sightings. This was the first time I learned how to spot whales; look for the spray first, spouts and blows are distinctive to each species and can look like puffs of smoke on the horizon. 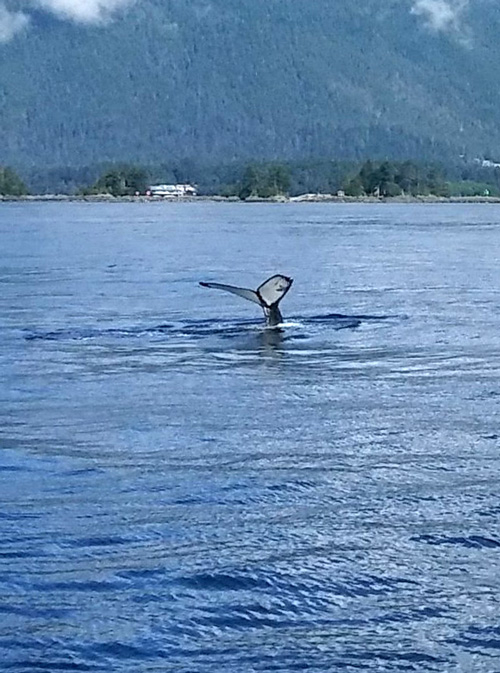 When viewing Humpbacks, watch for the blow, then keep watching and look for dorsal fins as they dive a couple times before making the deep dive displaying their powerful tail “flukes” that propel them deeper through the water. The shape and size of flukes are also different for every species. It took me a while to learn but so exciting when I finally got the hang of it! 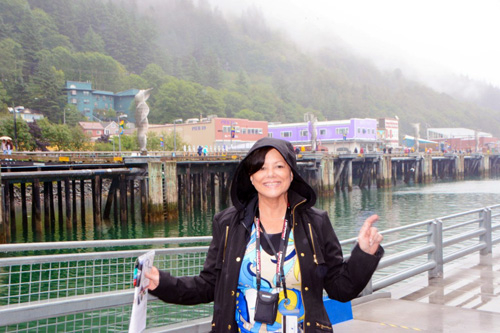 Related: Alaska Cruises With Holland America- On Sale Now! 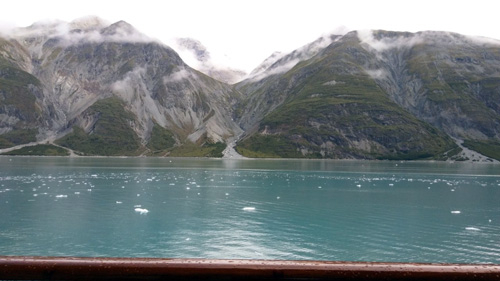 Sailing slowly all day around Glacier Bay was certainly one of the main highlights of this cruise. It was quite cold and as I mentioned we found it so convenient to bundle up, step out onto our balcony to view the sights, and take photos and then just step back into warmth. While outside a couple times, we heard deep thunder sounds but the weather wasn’t rainy. We thought maybe bad weather was imminent and then I realized that wasn’t thunder at all! I had forgotten I heard people describe the sound of glaciers calving (breaking off) is just like thunder! I felt pretty darn foolish forgetting that. I never really got to see them calving but certainly heard it several times. Now you know! 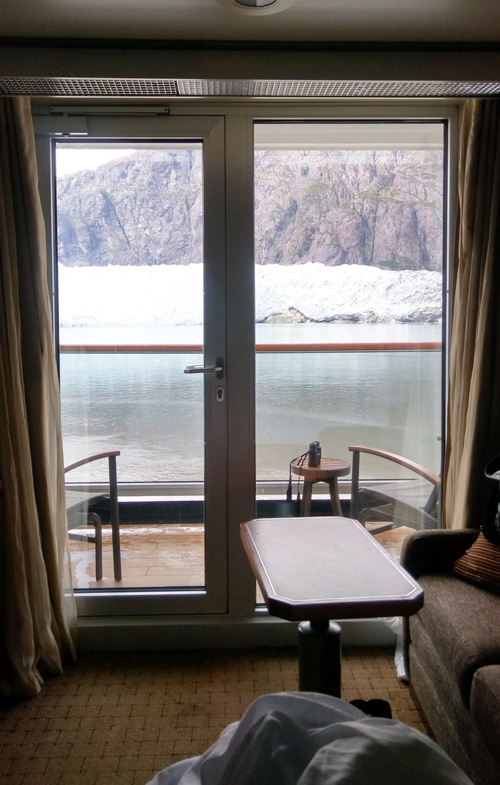 Our cabin was on deck 5 forward and I didn’t realize they opened up doors to the outside on this deck allowing guests to gather on the bow to view the beautiful scenery and take photos as well. Staff members were there greeting passengers and handing out hot chocolate and later steaming Dutch pea soup which is a Holland America line tradition. It was rather chilly in the halls that day, but a fun sociable experience. 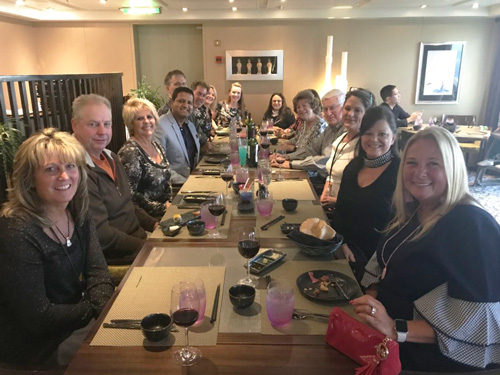 Later this evening we dined with some other guests onboard and experienced the specialty Asian restaurant Tamarind. I tried several dishes, among them were the Wasabi crusted beef tenderloin and Jewels of the Sea. Some of the best food and service I’ve experienced, just delicious! 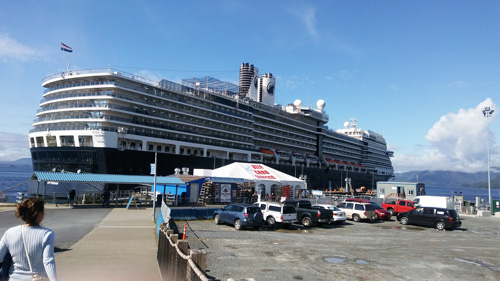 Other than a few small luxury ships, Holland America is the only line that stops in Sitka and am so happy we got to experience this port! 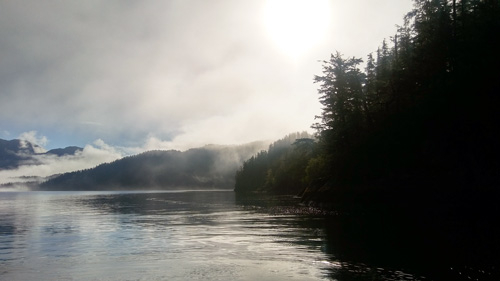 We took an early morning excursion in Sitka Sound which started out foggy, almost even a bit eerie, in the quite remoteness. 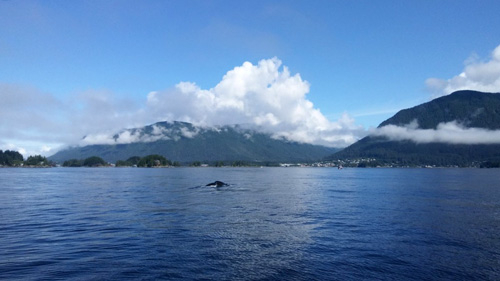 Once that fog cleared we were blessed with such clear blue skies and a plethora of otters and whale sightings. 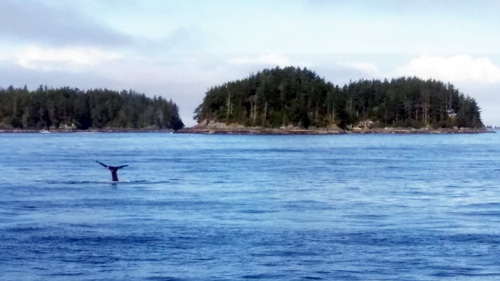 So much prettier in the sunshine and much better whale photos! Related: View All Discounted Holland America Line Cruises! 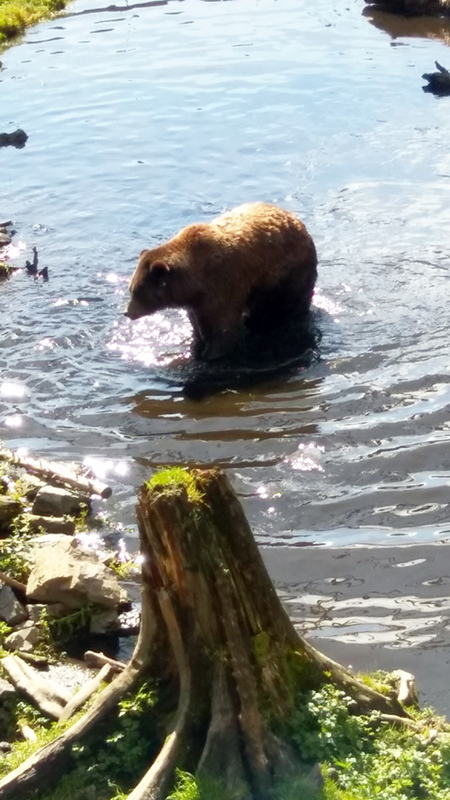 Then we transferred back onto a tour bus and headed to the Fortress of the Bear rescue sanctuary for up close views of black and brown bears! Related: Last Minute Cruise Deals! View All Sailings Now! 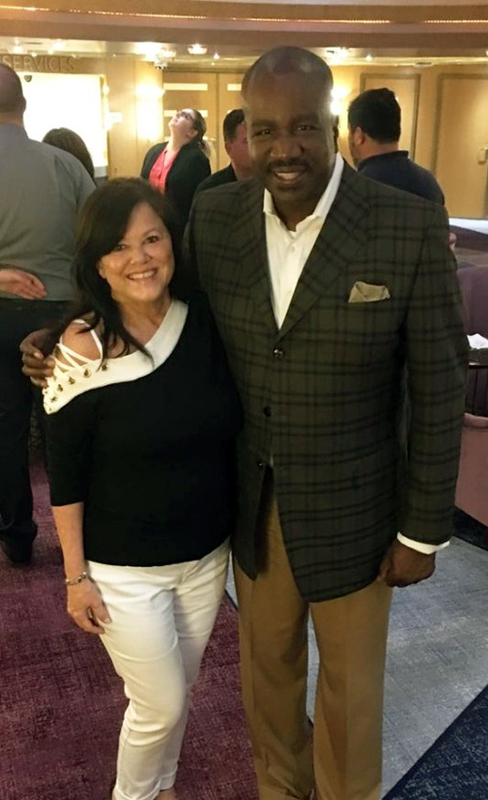 Later this evening I had the pleasure and honor to meet an unexpected guest, President of Holland America Line Orlando Ashford! Another sunny day in a charming Alaskan town. After early morning skies cleared, we took a walk around the quaint port city and we stopped to take in the popular Lumberjack Show. Afterward we grabbed a quick lunch of famous Alaskan King and snow crab at a nearby local pub and restaurant. 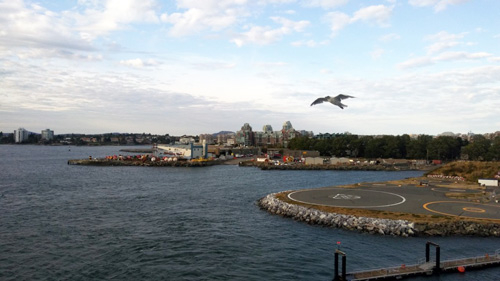 We arrived a bit late into Victoria so we chose to walk around near the ship enjoyed dinner at a restaurant on the pier. Afterward I wanted to see the famous Fairmont Empress hotel so we stopped in for a cocktail and on the way got to see the beautiful Parliament Building lit up at night! We had an Exclusive Signature Empress 1908 lavender gin cocktail and friendly bartender. Once back on the ship, we enjoyed one last night at our favorite evening haunt, BB King’s Blues Club. That club had the best music and band in our opinion. I have to say this cruise and ship was such a great experience and fun all around. 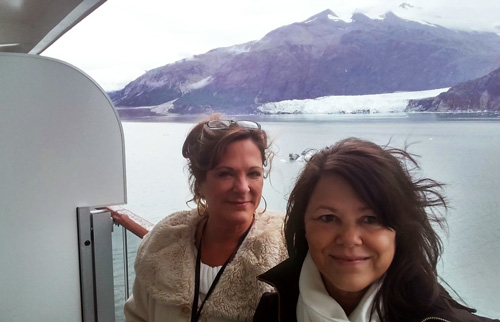 I highly recommend cruising on the Alaskan Explorer cruise with Holland America, you’ll enjoy excellent itineraries, excursions, on-board service and food. You can’t go wrong!